The Christian Association of Nigeria has called on all churches in the country to pray for the freedom of Leah Sharibu from the captivity of the Boko Haram terrorists on this year’s Good Friday, March 30. The organisation also reminded the Federal Government and the security agencies of the need to free Leah and other captives from the captivity of the Boko Haram terrorists. 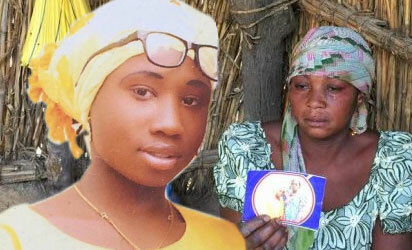 The President of CAN, Dr. Samson Ayokunle, in a statement by his Special Assistant, (Media & Communications), Deacon Adebayo Oladeji, obtained by The PUNCH on Wednesday in Jos, said the call for prayer for the release of Leah was in line with the Passion Week when Jesus Christ, with passion, willingly went to the cross in order to pay for the sins of the world. He said, “Following the trials, Jesus Christ, though sinless, was scourged by the Roman soldiers, and then forced to carry His own instrument of execution (the Cross) through the streets of Jerusalem along what is known as the Way of Sorrow. “Jesus was then crucified at Golgotha on the day before the Sabbath, was buried and remained in the tomb until Sunday, the day after the Sabbath, and then gloriously resurrected. It is referred to as the Passion Week because in that time, Jesus Christ truly revealed His passion for us in the suffering He willingly went through on our behalf. “What should our attitude be during the Passion Week? We should be passionate in our worship of Jesus and in our proclamation of His Gospel! As He suffered for us, so should we be willing to suffer for the cause of following Him and proclaiming the message of His death and resurrection. Ayokunle said, “It is high time security operatives lived up to the expectations of the people. Sharibu was among the 105 female students of Government Science Technical School, Dapchi, Yobe State who were kidnapped on February 19. CAN also called on the Federal Government to put every measure in place to facilitate Leah ’s release. The organisation also demanded that Nigerians should apologise to its former President and Founder of World of Life Bible Church in Warri, Delta State, Pastor Ayo Oritsejafor, over wrong accusation. Also, the Secretary of CAN (North West Zone), Sunday Oibe, in an interview with The PUNCH, on Tuesday, backed the demand by a former Minister of Defence, Gen. Theophilus Danjuma, that Nigerian should defend themselves against terrorists and insurgents because the military had been compromised. He said, “The testimony from the parents of this lady (Leah Sharibu) and her colleagues was that her captors told her to renounce Jesus Christ and she refused. That was why they held her back; now, if that is the case, the question that we need to ask the government is why is it that it is only her that was held back. “The duty and responsibility of any responsible government is to protect the lives of the citizenry. That is why we are asking the government that whatever they have spent to bring back the other girls, even if it means spending times 10 of that amount to bring her back, they should do that because failure to do that will give us the opportunity to read different interpretations and dimensions to it. “If out of 105 girls and one of them is being held back because she is a Christian , then , we have every reason to be worried and the government too must be worried. The international community is also worried because there is no reason why this one and only girl should be held back. According to Oibe, who is also the Public Relations Officer of the Northern Elders Christian Elders Forum, Nigerians should apologise to Oritsejafor, “the spiritual lens of God,” who has been vindicated by T.Y. Danjuma.